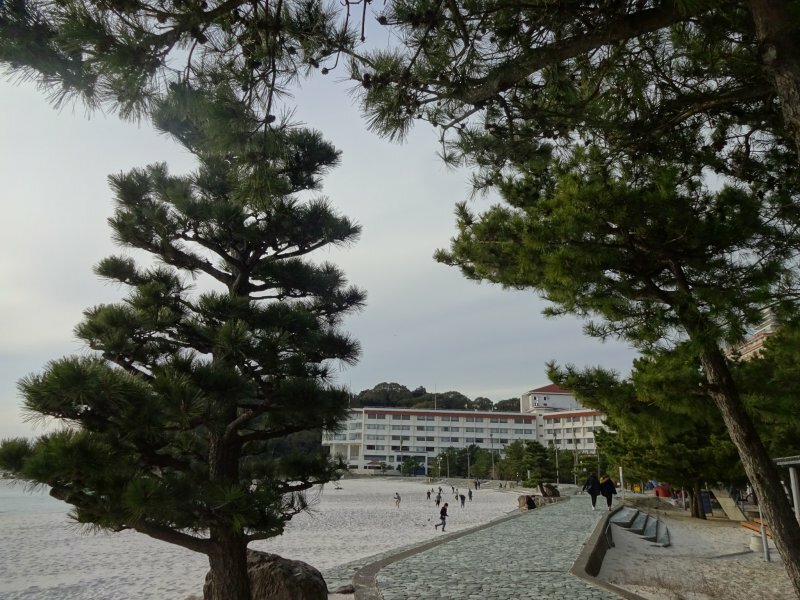 With the sound of waves rolling on shore and a white crystal sandy beach at the doorstep, Shiraraso Grand Hotel warmly invites holiday-makers to enjoy a relaxing break at Shirahama Onsen, one of Japan’s best-known hot spring resorts. 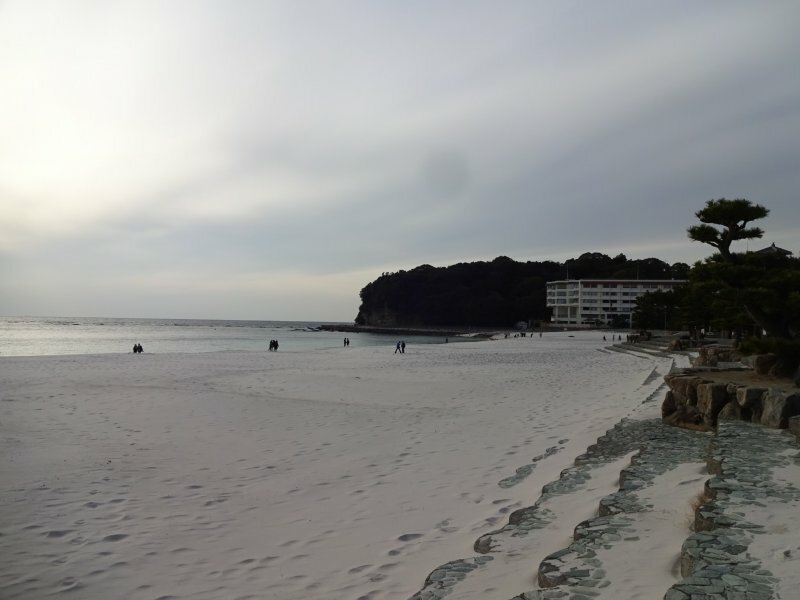 Located right by Shirahama Beach, Shiraraso is a prime location to make the most of your time by the ocean. 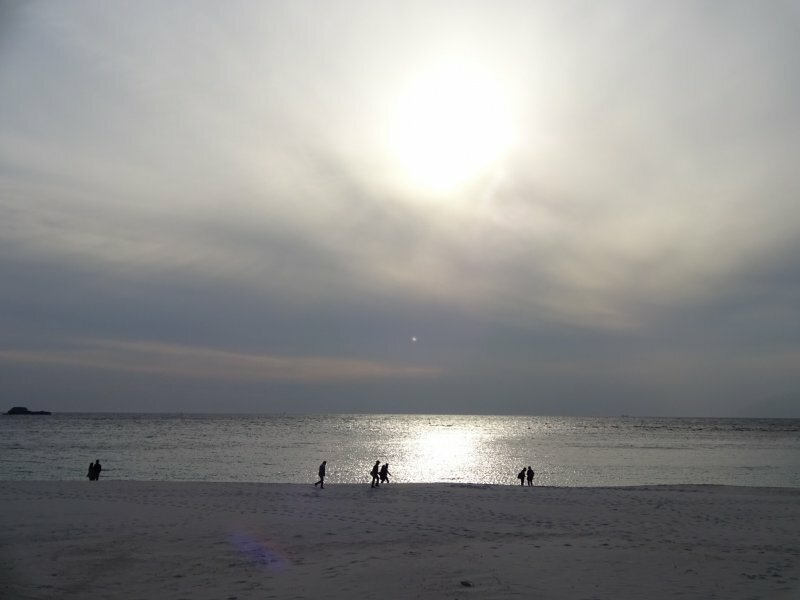 Whether you want to stroll along the beach at sunset, jog along the shoreline before breakfast, or spend a day sunbathing, you will not be far away from the convenience of your room and other hotel facilities. 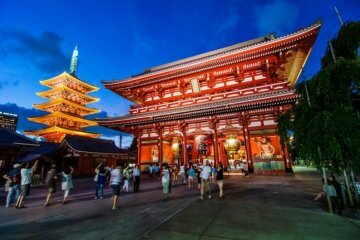 Shiraraso was first established in 1929 and it has since been refurbished several times. 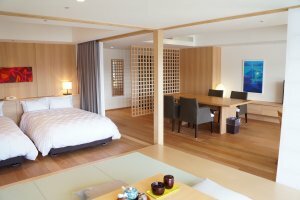 In 2016 the onsen facilities saw a complete overhaul and rooms with beds were introduced. 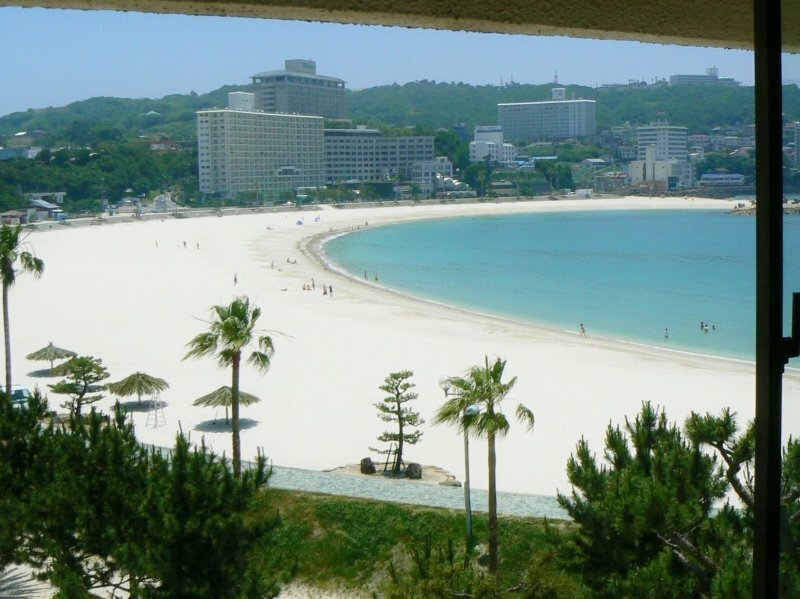 The six-story hotel overlooks one side of the over 600 meter long Shirahama Beach. All rooms have an ocean view. The majority of the hotel’s 100 rooms are Japanese-style rooms featuring a tatami floor, and a futon for bedding. There are large, double rooms with a connecting door in the middle perfect for a group or family outing. 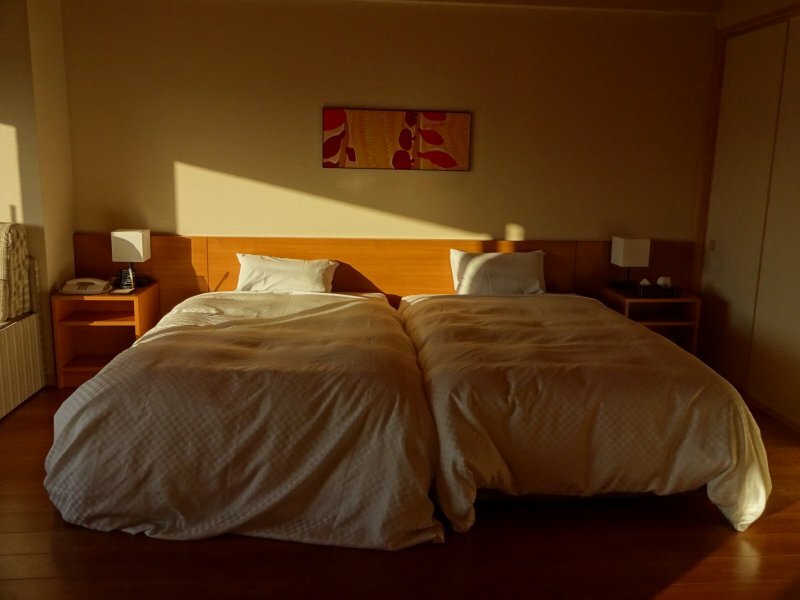 One room has flooring with a double bed and a sofa, sleeping three people, while the other room is a tatami room with space for four futons. 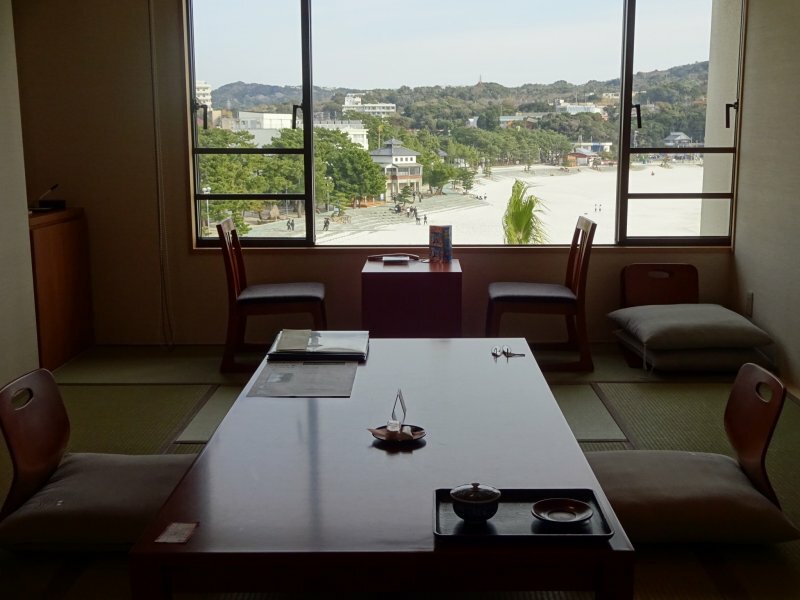 On the top-story Royal Floor, there are also Japanese-Western style rooms with twin beds and dining tables as well as tatami space to enjoy the Japanese style of the room. Several of the rooms have recently been refurbished and the white walls are nicely decorated with modern art paintings. 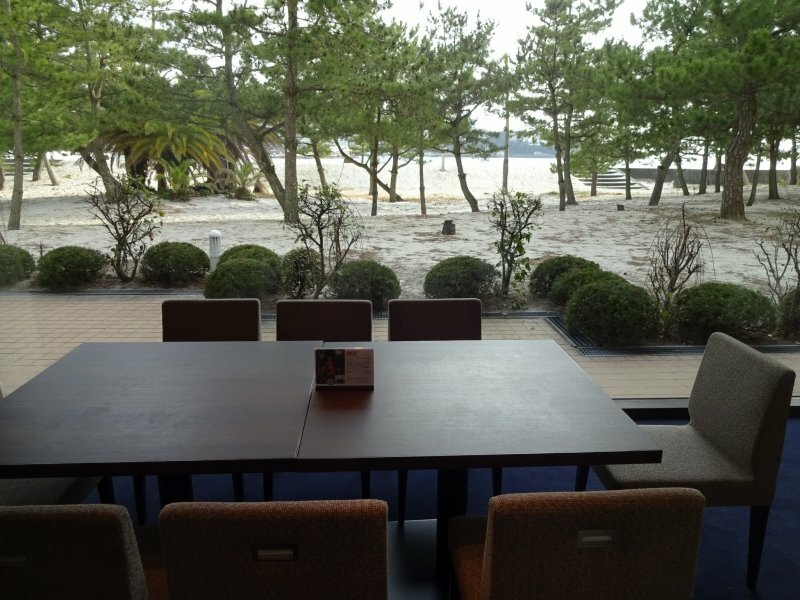 Big windows allow sunlight to fill the rooms and provide an excellent view of the beach. 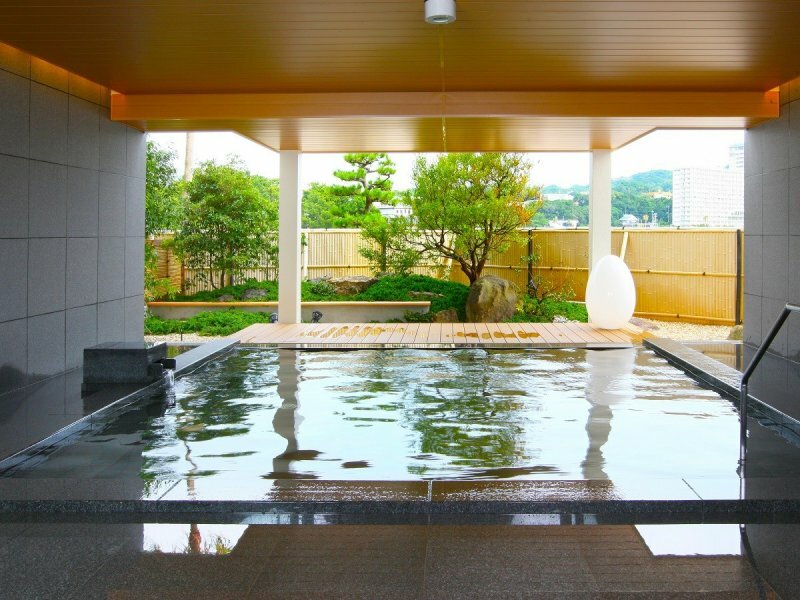 The hotel features two onsens. On the first floor is "Matsukaze". This bath has a Japanese flair with a wooden bathtub. On the second floor you find "Shiokaze". This bath has a Western-style atmosphere. The bathtub is made of stone and the walls are painted white. Both the first and the second floor baths have an outdoor section. 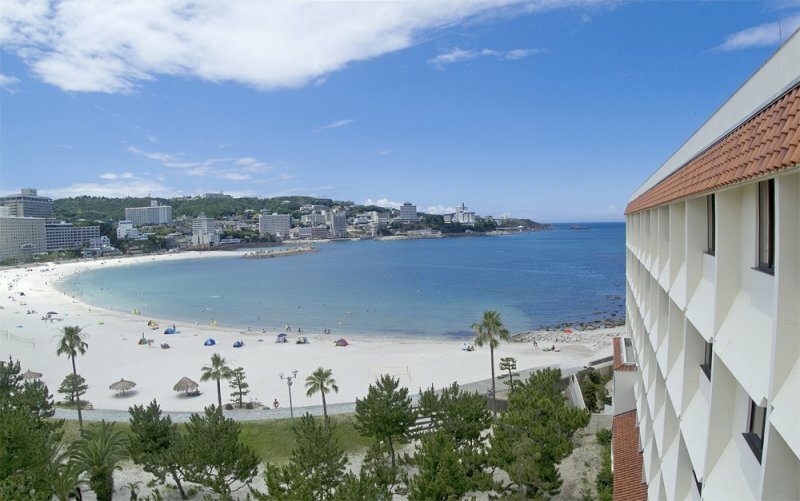 The one on the second floor overlooks the ocean so you can relax in the mineral-rich water while gazing into the point where the blue of the ocean joins the blue of the sky. In case you do not want to share bath time with other people, you can rent a private bath (45min at 2,160 yen). Dinner at the Shiraraso Grand does not disappoint, no matter what time of year (menus are subject to change depending on the season). First there is plum wine and a beautiful display of delicious starters: salmon roll, pumpkin cooked with cheese, roasted duck, Japanese ivory shell and salted squid cuts. The sashimi plate contains pieces of tuna, greater amberjack, squid and cutlassfish. 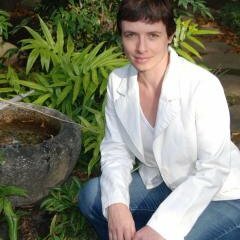 The main course includes a plate with seasonal fried fish, spiny lobster tail in a soup, and braised pork belly in demi-glace sauce, followed by egg custard. The highlight of the meal is the Shirara Nabe, an original hot pot made of white miso, soy milk and fresh cream. This rare, white broth was inspired by the white sandy beach outside the hotel. The dessert is with ice cream and seasonal fruit. 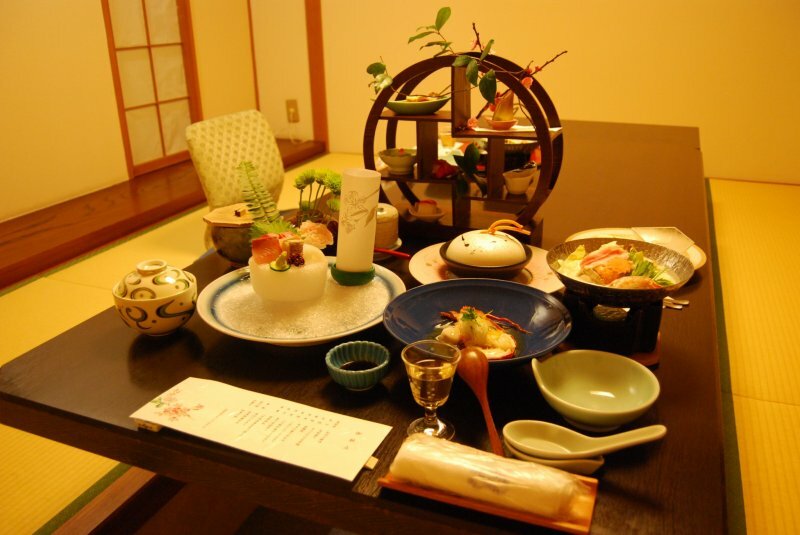 The extensive drink menu includes local sake, liqueurs, and wines, including many types made only in Wakayama Prefecture. Since Wakayama is Japan’s main producer of ume (Japanese apricot), there are around 13 variations of plum wine to be tasted. Both dinner and breakfast are Japanese-style. For vegetarians the hotel can provide an alternative menu. 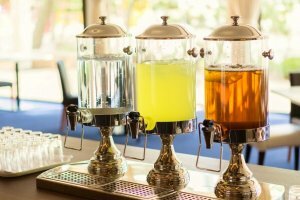 The lobby area has a Free Drink Corner with cold water, ume water and yuzu water. Ume and Yuzu (a citrus fruit) are locally produced on the Kii Peninsula. 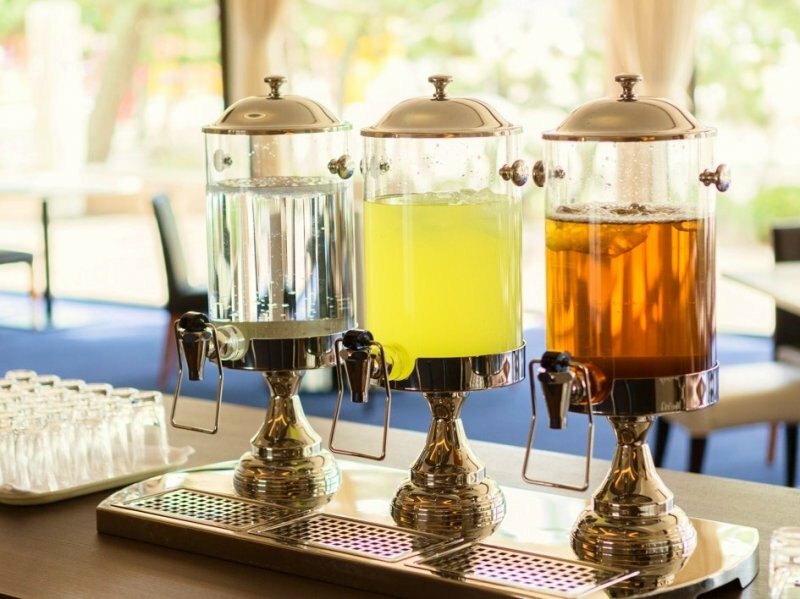 On the drink menu of Sugar Beach Café are coffee, soft drinks and alcohol. 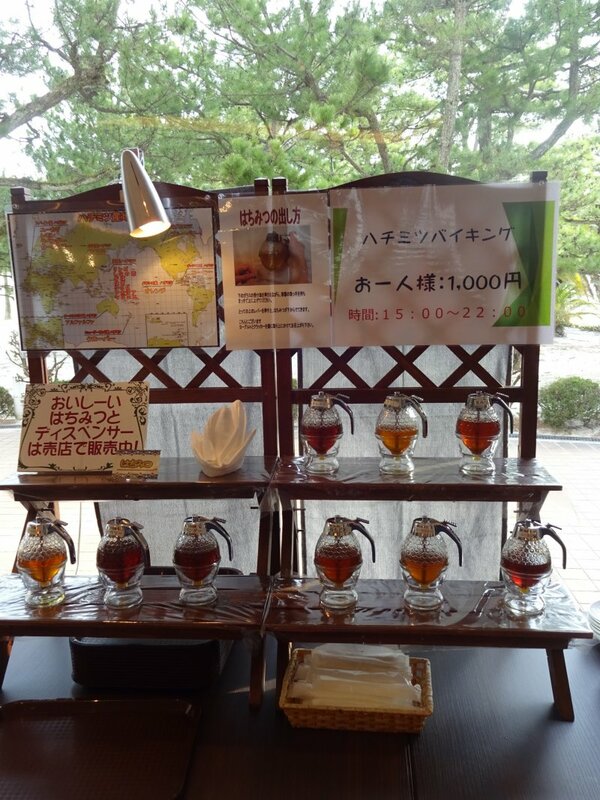 At the Hachimitsu Viking (honey smorgasbord) you can sample nine different honeys. 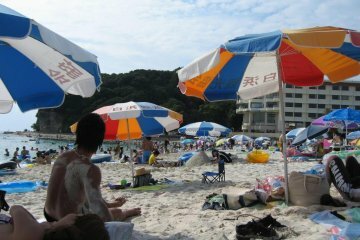 Sample as much as you like for a flat cost of yen 1,000 per person (15:00-22:00). 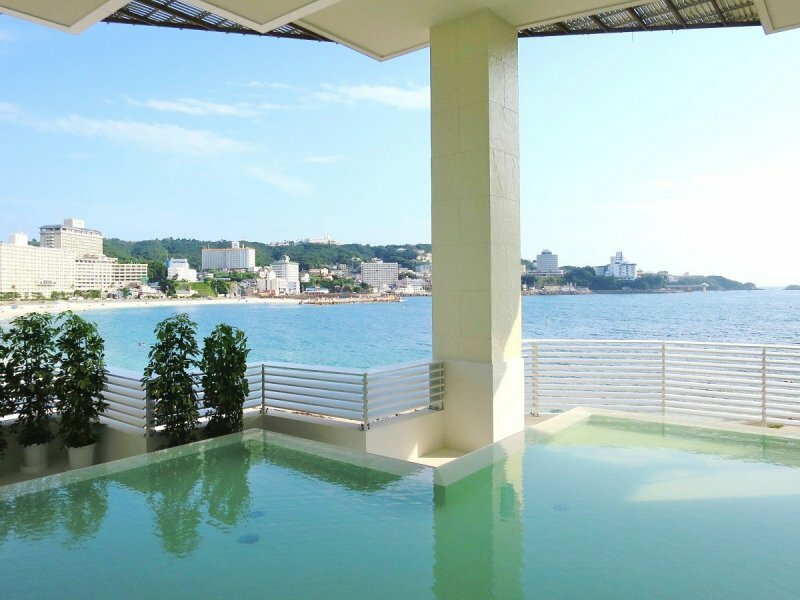 From May to September guests can hang out at the hotel pool overlooking the ocean. 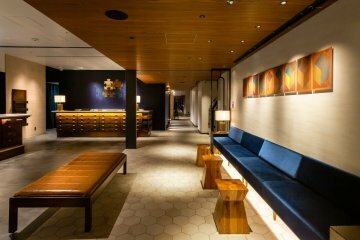 There are some tables and chairs where you can sit and relax as you enjoy a drink or snack. Access to the pool is strictly guests-only. 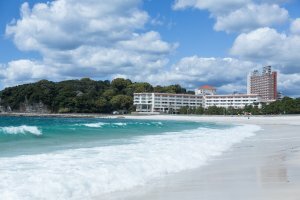 Guests who prefer the beach will benefit from showers installed by the beach entrance of the hotel that allow you to rinse off the beach sand before entering the hotel. 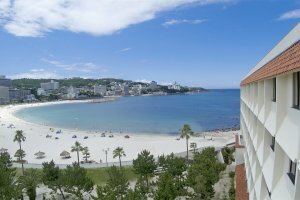 The hotel connects directly to the beach promenade. 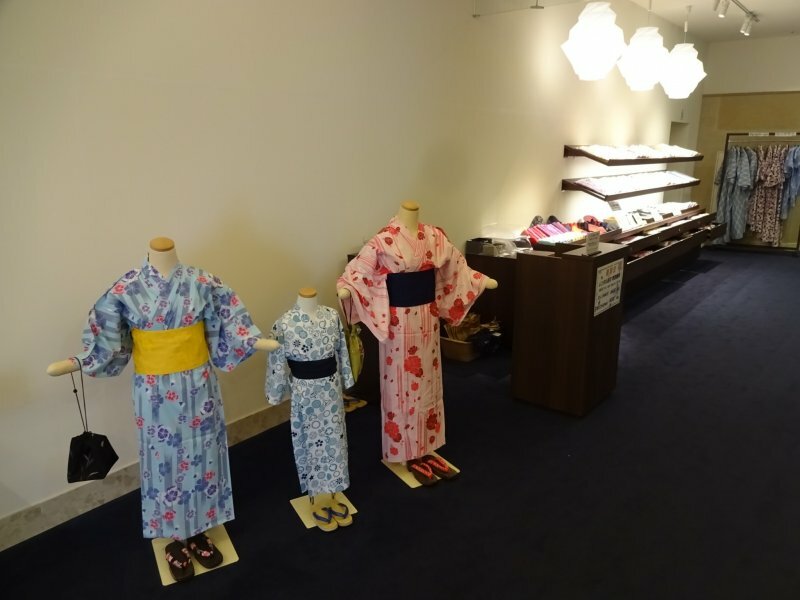 The hotel’s Kimono Corner has about 300 kimonos in different colours and patterns, both for adults and children. Alternatively you can book an appointment for a treatment at the Massage Corner. A large plush toy panda poses for photos in the hotel lobby and reminds guests that Adventure World near Shirahama Onsen is one of only two places in Japan where you can see real panda bears. For those who want to venture further afield, the Kumano Kodo (UNESCO World Heritage Site) pilgrimage trails are within easy reach. 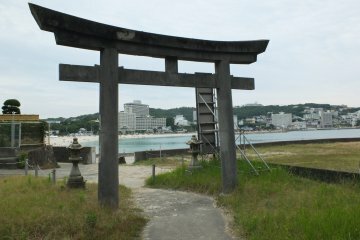 Or, check out the little shrine in the forest just behind the hotel. 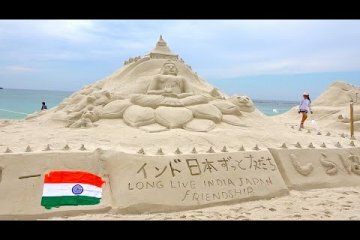 Several events take place throughout the year, such as the Sand Art Contest at Shirahama Beach in late May. 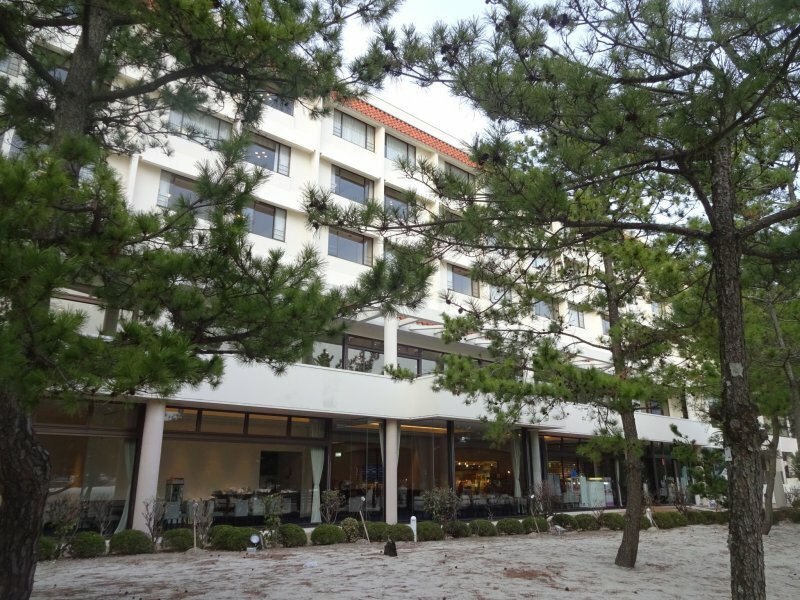 With a beautiful beach and many attractions nearby, Shiraraso Grand Hotel is the ideal place for a weekend break at Shirahama Onsen. Located in the south of the Kii Peninsula in Wakayama Prefecture, Shirahama Onsen can be reached by JR Kuroshio Express from Osaka (Shin-Osaka or Tennoji Stations, 2 hr 30 min). A couple of Kuroshio trains also run from Kyoto Station directly to Shirahama (3hr). 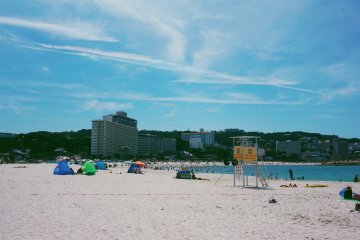 There are two daily flights from Haneda Airport to Shirahama Airport on JAL (1 hr 15 min). 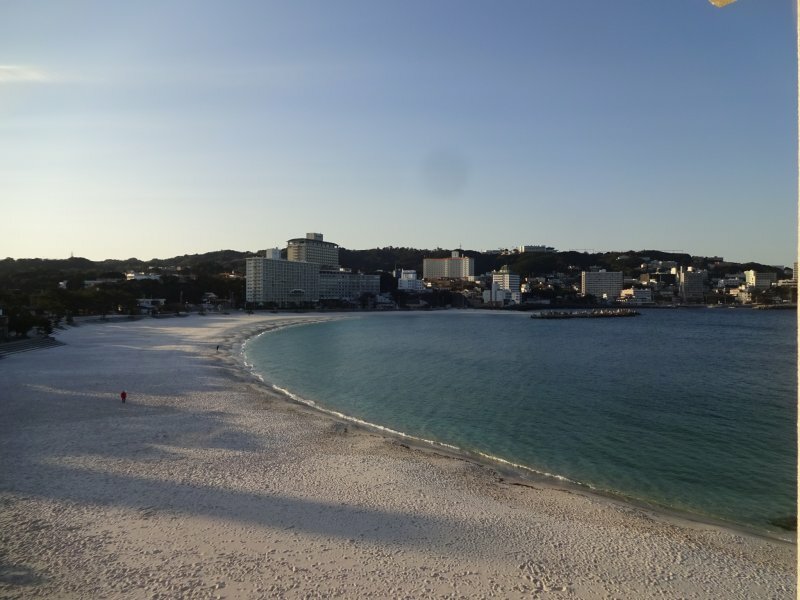 There is a free shuttle bus that runs between Shirahama Station and Shiraraso Grand Hotel. From the station the shuttle leaves in the early afternoon. From the hotel back to the station the shuttle departs at 8:41am (arriving at the station at 9:30am) or 10:11am (arriving at 11:00am). Alternatively, taxis are waiting by the station and can be called by hotel staff (10 minute ride). Why go to a tropical island when you can come here? This is an amazing place. 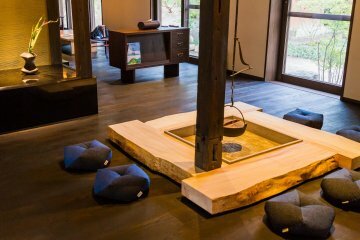 The combination of the Western and Japanese elements combine comfort and culture.